Lloret de Mar is a popular Catalonian resort city located on the Costa Brava. The first documented evidence of the city was in 966AD. It was described as Loredo from the Latin for laurel bay. It was attacked frequently in the Middle Ages by the Saracens. Folklore states that the traditional “Dance in the Town Square” dates from this period. The town center was originally located one kilometer further inland as a defense against pirate attacks. The port was commercially active throughout the 18th century. Today, Lloret de Mar attracts hundreds of thousands of holiday seekers each year. 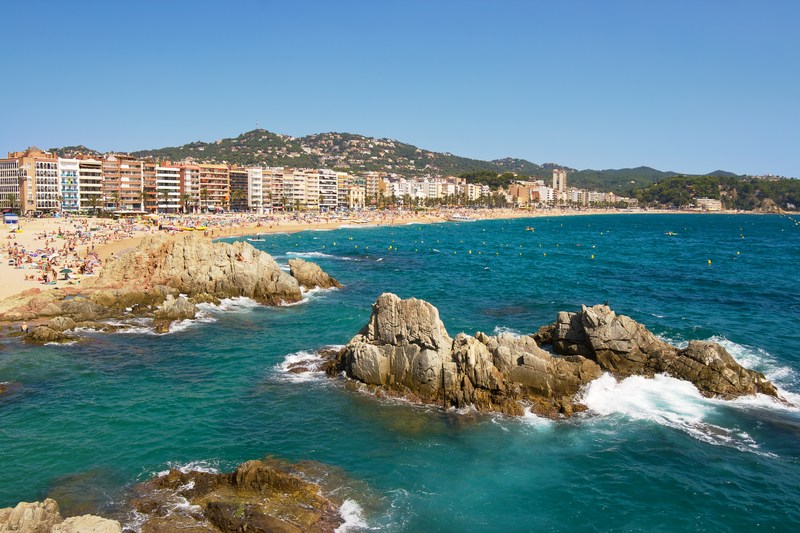 Approximately seventy five kilometers away and easily accessible, Lloret would make for a wonderful day trip for anyone visiting Barcelona on business or pleasure. Tourists enjoy the Blue Flag award winning, white sandy beaches that are washed by the warm waters of the Mediterranean Sea. They can enjoy numerous secluded coves and inlets off the main beach. Visitors looking to explore the culture and history of the area will be amazed by the ancient churches, monuments and museums. They can tour the Church of Santa Roma that was built in 1522 and spectacularly demonstrates Moorish, Byzantine and Renaissance architectural influences. The Castle of Sant Joan was built in the 11th century and was used to repel attacks from Genoa, England and France. All that remains today is the castle tower that was restored in 1992. Today, visitors can enjoy marvelous views of the surrounding area from its summit. Tour the city and see the Monument to the Fisherman’s Wife and the Santa Clotilde botanical gardens. The monument is a bronze sculpture erected in 1966 that is an emblematic symbol of the city. The garden was designed by Nicolau Tuduri in the style of the Italian Renaissance and offer wonderful views of the sea from its cliff top location. Visitors will also enjoy the time spent touring the maritime museum. The young will be thrilled to spend the day at Gnomo Park. This gnome themed indoor/outdoor family friendly attraction has a playground, ball pool, and a craft workshop. There are also screenings of children’s films. The young at heart will be enthralled by Lloret’s wide variety of exciting night life. Whatever your pleasure, cultural immersion, a view into the past or day of sunbathing and water sports, Lloret de Mar is well worth the hour or so trip from Barcelona.